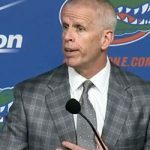 Jeremy Foley has three-and-a-half months left as athletic director of the Florida Gators but still took 30 minutes on Tuesday to stand in front of gathered media and a national audience to discuss his career, explain his decision to retire and send a message to Florida fans that all will be fine despite the most successful AD in school history departing with no succession plan in place. After 25 years as the Gators’ athletic director and 40 working as a member of the athletic department, Foley will depart to become a full-time grandfather and concert-goer. Sure, he’ll be emeritus athletic director at Florida, but that will likely be a ceremonial title more than anything and a way to keep Foley involved with future UF fundraising efforts. Foley’s time with the Gators included 27 national championships and 130 Southeastern Conference titles in 13 sports (12 in the SEC) over his 25 years in charge. He oversaw the vast majority of Steve Spurrier‘s coaching tenure and hired every other sport’s most successful coach in its history. “Jeremy always — always — made unbelievable hires as it relates to people who love the University of Florida,” former head basketball coach Billy Donovan said Tuesday on ESPN Radio in Gainesville, Florida. Foley’s almost-goodbye press conference included little in terms of eye-opening details. 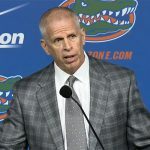 He said he truly started considering retirement in February and noted that the turnaround of Gators football coupled with the health of every other sport contributed to his deciding that now was the perfect time for a transition at the top. Though he joked that seeing Donovan and Urban Meyer both walk back departures convinced him to do the same, Foley appeared firm in his decision. Recounting his career, Foley explained that he operated Florida as if it always had two strikes against it stemming from football and basketball compliance issues in the 1980s. He also insisted that in order to be a national brand, an athletic program must be about more than the two major sports programs. What is Foley most proud of? 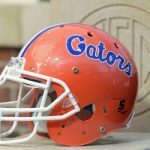 Changing the perception of the Gators from annual “sleeping giant with untapped potential” to a powerhouse in collegiate athletics. Why did Foley never serve on a national committee? Because he did not want to spend time and give effort to anything else but improving the Gators athletic program. Foley got choked up a bit discussing the people he worked with at Florida for the last four decades. Even though he will still be around in one way or another, he knows the day-to-day relationships and activities will never be the same. No, Foley will not choose his successor; it would not be “appropriate,” he said. Yes, Foley will serve as a resource for Fuchs and former board of trustees chair Manny Fernandez, who will lead the search (and also led the search that resulted in UF hiring Bernie Machen as president over a decade ago). Perhaps most importantly, Foley knows his job at Florida is not yet done. He said he made facility promises to head football coach Jim McElwain, head baseball coach Kevin O’Sullivan (who Foley confirmed has said he will remain with the Gators) and head softball coach Tim Walton. Foley also wants to see through the opening of the $25 million Hawkins Center for student-athletes and the $64.5 million renovation of the Stephen C. O’Connell Center. For the latter, he’ll be gone nearly three months before it opens, but you can bet he will be at the ribbon-cutting ceremony. I didn’t stick around Gainesville and rise up the ranks of the University Athletic Association like Foley, but for three years I started out my professional career just like he did, as an athletic department intern. Hearing “I have work to do” — or more accurately, “We have work to do” — as Foley walked out of a press box, down a hallway or away from a friendly conversation into a meeting was far from abnormal then and is probably still a regular occurrence now. Because that’s what Foley was ultimately about — the work. But that doesn’t mean he didn’t have fun. Hell, when you spend four decades getting paid to watch sports for a living and the results of your efforts are national championships, tremendous friendships, lifelong memories, universal praise and something, somewhere on a major college campus being named after you at some point in the near future, well, there’s really only one thing left to say.